Let’s start with the important part, the sound quality. In the words of Ace Ventura, it’s good. There are certainly better headsets out there for the audiophiles amongst you, but you’ll struggle to find anything that puts the Kave to shame within its price range. The sound isolation is decent, so you won’t hear too much outside noise whilst you’re gaming, however it doesn’t work both ways. There is a lot of sound leakage from the Kave, so if you have the volume cranked then everyone else in the room will hear what you hear. 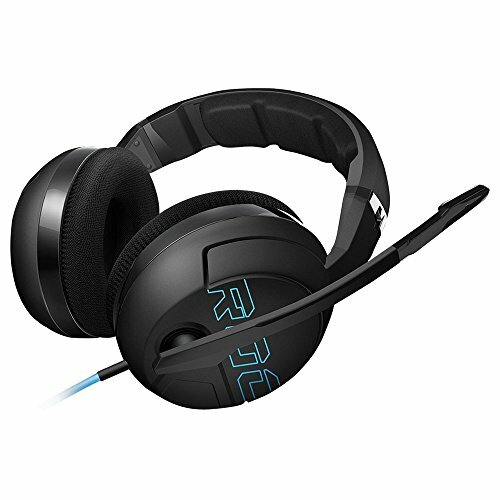 Like pretty much all gaming headsets, the Kave is big on bass but not to the degree you’d expect. The result of this more balanced sound output is that the Kave functions well as an all-round headset for watching films and listening to music, rather than just a gaming headset. It even comes with a detachable mic for when you just want the audio. Unfortunately, if you’re thinking about doubling this up as a pair of mobile headphones then you better have a coat pocket like the Tardis, because the Kave XTD comes with a monstrously long cable, complete with volume controller. This is great for use with a PC or console, but makes it rather bulky on the move. A modular, detachable cable would have been nice, with a short standard cable and an extension provided. Aesthetically, the Kave isn’t much for subtlety but it has a certain sense of style. The earcups are huge, which is great for the big eared chaps like myself who have a lot to squeeze in there. However I’m not a huge fan of the garish baby blue accent colour and wiring, or the shiny plastics which have been thrown in amongst the matt finish of the lion’s share of the headset. You have to break up the monotone somehow, but it feels like Roccat missed the mark here. The Kave feels like a solid piece of kit though, well-built and designed. My only real complaint is that there is too little padding on the earcups, so people with larger ears may find them pressing against the inside of the earcup. It’s not a huge problem and I’ve stopped noticing anything now, but I did feel it a lot the first few times I donned the Kave. Beyond that the Kave is comfortable and surprisingly light, considering its size. It may not have a party piece or any defining features, but the Kave XTD is a solid stereo headset at a good price. It’s well designed and provides great sound quality and comfort at an affordable price point. A few niggles here and there cost it the high score, but it’s still worth your money.